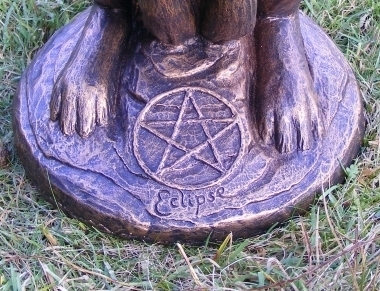 Garden sculpture, stands approximately 15” high or (38cm). Cast in reconstituted stone with a bronze effect finish, and frost proof so perfect for the garden, or inside. 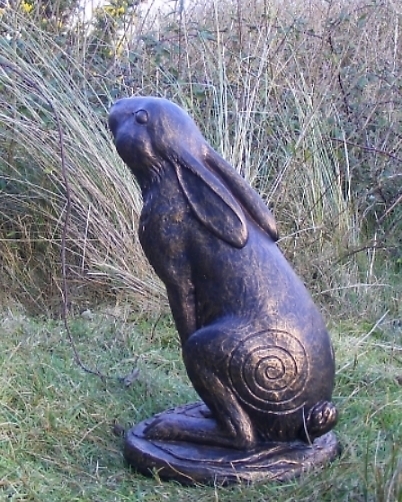 The myth of the Moon Gazing Hare reflects ancient beliefs. 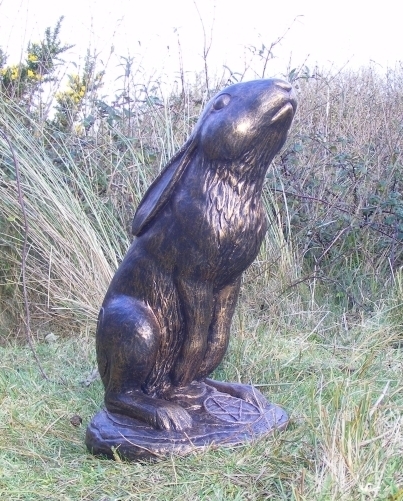 Pagans believed that seeing a moon gazing hare would bring growth, re-birth, abundance, new-beginnings and good fortune. 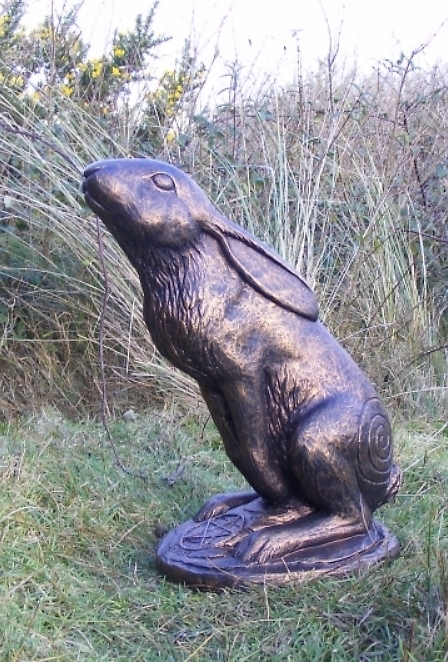 The hare is known to be sacred to the goddess Eostre and eventually became known as the Easter bunny. At Easter we eat Hot-Cross- Buns, the cross on the bun is said to represent the four quarters of the moon, these buns were originally pagan offerings and were often hung from rafters to scare off evil that lurked in houses. The spiral is an ancient symbol thought to be the earliest known symbol of spirituality. It’s the symbol of the goddess, fertility, growth, rebirth and continual change. The spiral is said to represent the continued cycle of life and death. It is thought a clockwise spiral represents the first half of life and the anti clockwise spiral represents life in decline and returning to source. The meaning of the Pentacle. The pentacle is a symbol closely associated with Paganism and Witchcraft or Wicca. When the pentagram (five pointed star) is placed within a circle, it becomes the Pentacle. Although over 8,000 years old, the image of the pentagram is very applicable in our modern world. It is a symbol of Love, Light, Beauty and Protection. The pentagram tells us that we have the ability to bring Spirit to earth; this applies to every area of practical day-to-day living, as well as spiritual thought. The origins of the pentagram go far back, to remotest historical antiquity. 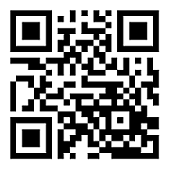 It has been venerated by many civilizations. It is the ruling of the higher mind over the lower elements of our being. It signals the awakening of cosmic consciousness and the beginnings of our own human psyche moving beyond the realms of physical form, and the perceptions limited to the five senses. It allows the infinite possibilities that exist within the Universe and frees us to explore and to grow. Traditionally, each of the five angles has been attributed to the five metaphysical elements of the ancients.